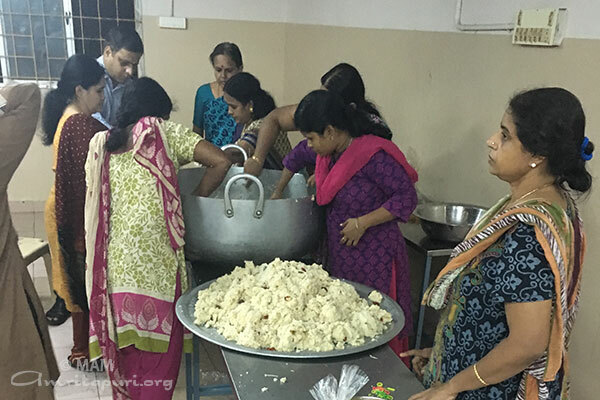 A national level trainers camp was held in Amritapuri from Dec. 25th – 31st, 2015. 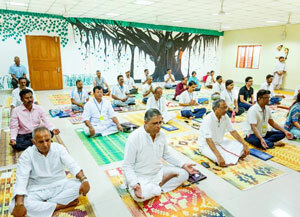 Participants from all over India came to become teachers of the Integrated Amrita Meditation (IAM) Technique and Amrita Yoga. 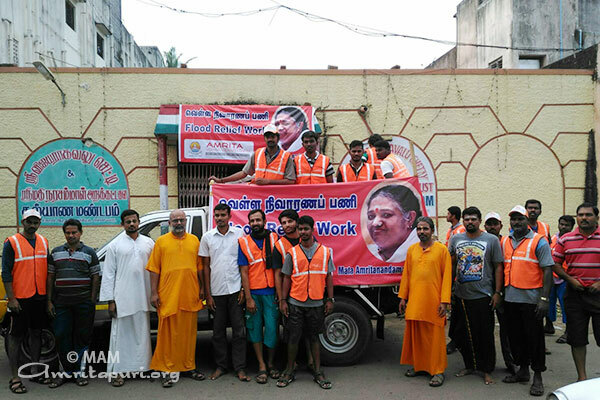 Individuals also learned how to lead youth groups and hold events under the Amrita Yuva Dharma Dhara (AYUDH) umbrella. 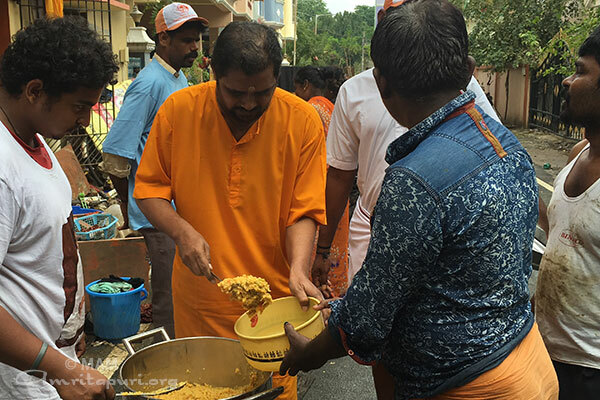 Swami Amritaswarupananda Puri inaugurated the camp and encouraged the trainees to lead spiritually centered lives and to carry forward the message of Sanatana Dharma with the light of Amma’s teachings. The trainees were exposed to inspiring talks by senior monks of the Ashram. 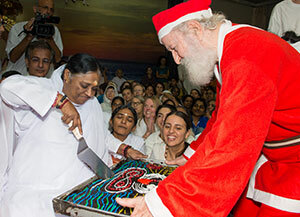 The talks, held in English, Malayalam, and Hindi, included topics such as The Importance of the Guru, Sanatana Dharma, and How to Have a Healthy Life with Natural Remedies. 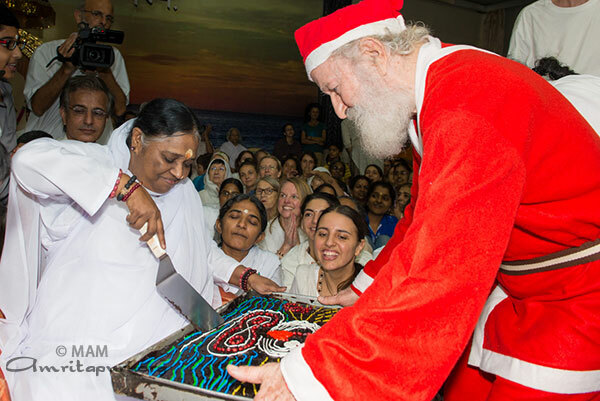 The sessions also focused on how science and spiritually can work hand in hand. Dr. Vandana Balakrishnan, from the Amrita Institute of Medical Sciences (AIMS), gave insights into her scientific research done on the positive effects of Integrated Amrita Meditation. 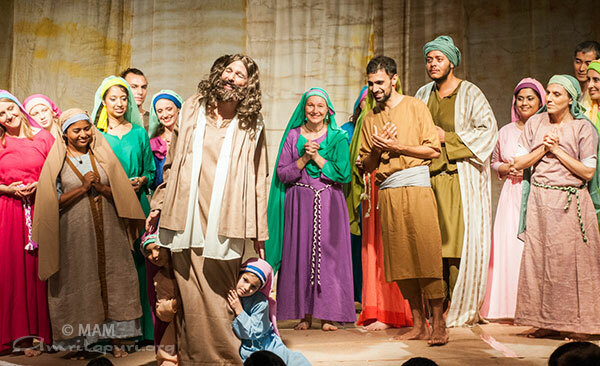 “I feel blessed to be part of this camp. I hope to regularly practice what I have learnt here and also be able to teach it to others,” said Nilesh (from Pune). At the conclusion of the camp, participants shared their inspirations and thoughts on how they will now carry the light of IAM, Amrita Yoga and AYUDH, to all corners of the country. 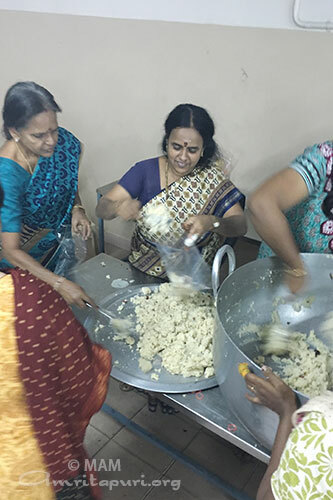 Amma has always led by example, and her senior disciples follow suit. 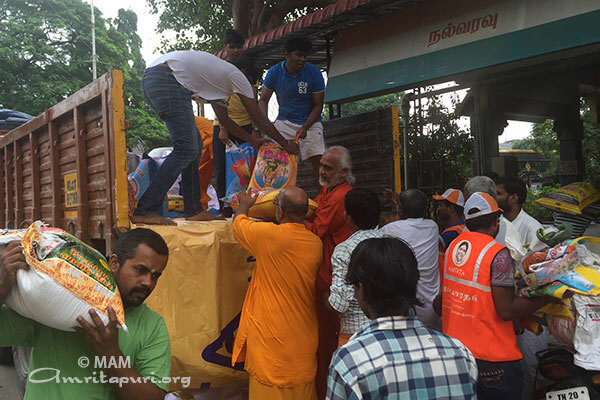 Here, her senior disciples personally unload the food materials from the truck, distribute food packages to those affected by the flooding. 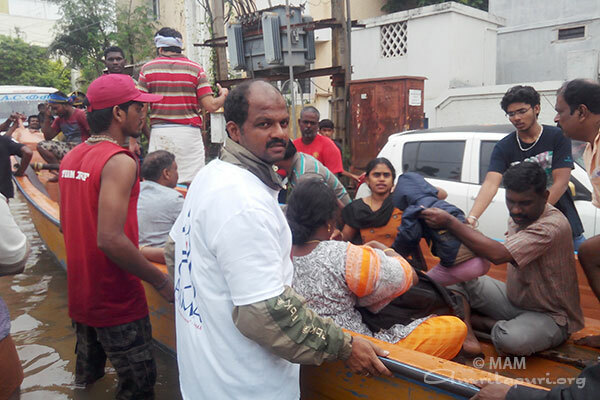 They are joined by more than 500 volunteers providing food, clothing, rescue operations, medical attention and essential provisions. We also donated Rs. 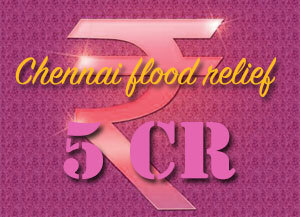 5 crore to the Chief Minister’s Relief Fund for emergency relief for those affected by the disaster. 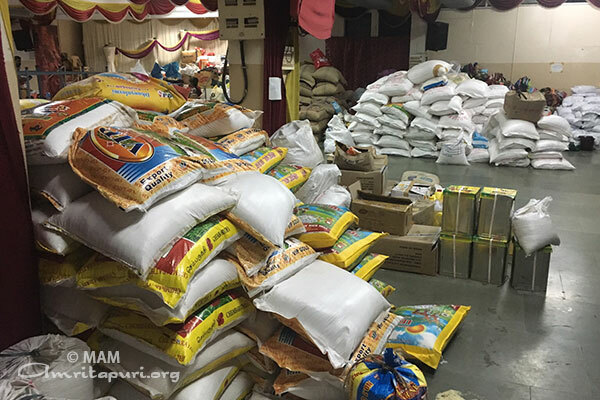 In the wake of the colossal loss and damages due to the unprecedented rains in Chennai and parts of Tamil Nadu, MAM donated Rs.5 Crores towards the Chief Minister’s Relief Fund for relief and rehabilitation activities. On behalf of MAM, Swami Ramakrishnananda Puri met Dr J.Jayalalitha, Chief Minister of Tamil Nadu in Chennai and handed over the amount. 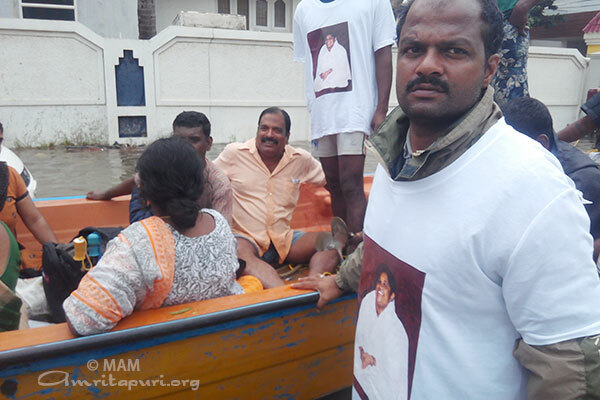 As directed by Amma, MAM volunteers have been actively participating in the relief work from the last week of November. 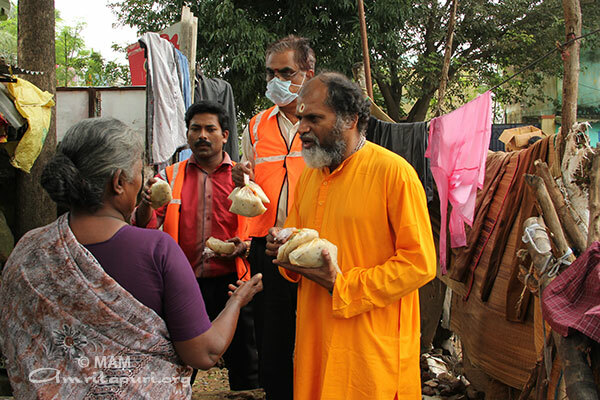 From December 1st around 500 volunteers comprising of students & faculties from the Amrita Vishwa Vidyapeetham campuses in Bangalore and Coimbatore along with devotees have been involved in relief activities including rescuing the stranded to safer places, distribution of food, medicines, essential provisions, utensils, stove, clothes, blankets, toiletries and other essentials in badly affected areas like MGR Nagar, Choolaipallam, Dr. Kaanunagar, Saidapet, Jafferkhanpet, Samiarmadom, Nallankuppam in Ashok Nagar, Tarapakkam and Sadanandapuram. 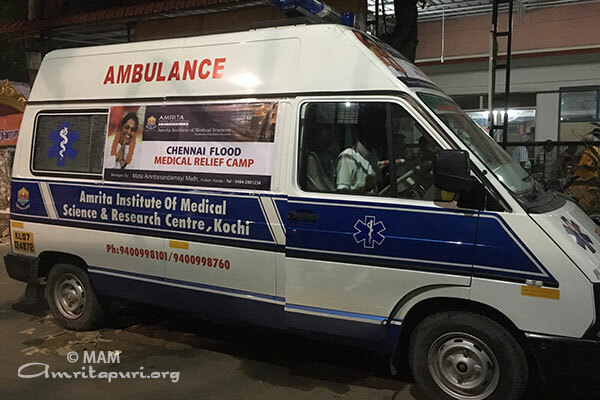 A Telemedicine van, two fully equipped ambulances which includes a cardiac unit, an emergency unit, a testing unit to detect epidemic diseases in two minutes, colour ultra sonography, X-ray radiography, mini operation theater, small delivery room, electro-cardiography and light microscopy along with a 25-member team of doctors and paramedics from Amrita Institute of Medical Sciences reached Chennai today and plunged into service of providing medical help. These teams will be fully equipped to handle any outbreak of epidemics and will also be providing preventive measures. 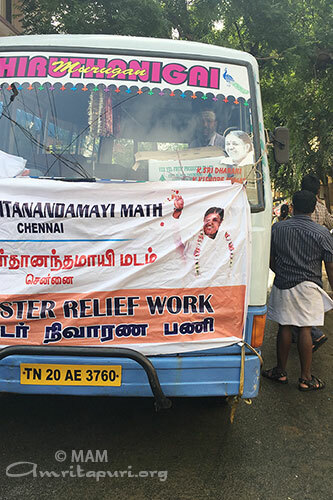 Over the years, the Mata Amritanandamayi Math (MAM) has been effectively helping in post-disaster situations. 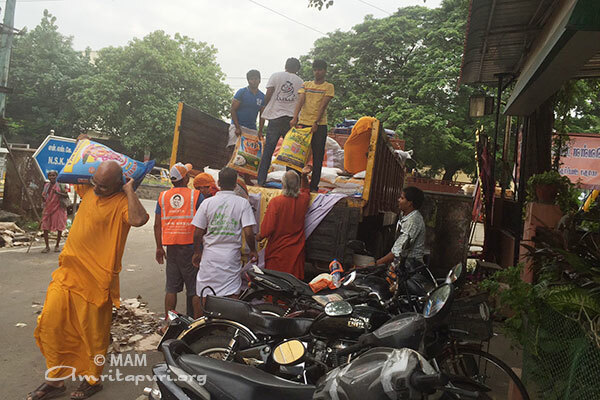 Starting from the earthquake in Lattur Maharashtra, the MAM was one of the biggest agencies post-tsunami to render immediate aid in the form of temporary shelters, food, clothing, etc. to long-term solutions like housing, vocational training etc. 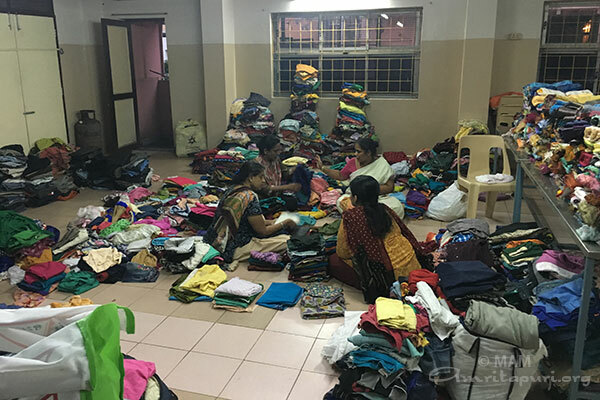 After the natural calamity in Uttarakhand, MAM is still active there helping rebuild houses, schools, colleges and providing vocational training, empowering women and tablet-aided learning for children. 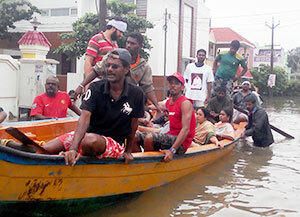 Due to incessant heavy rain, many low-lying areas of the city of Chennai were inundated on the late night of 1st December. 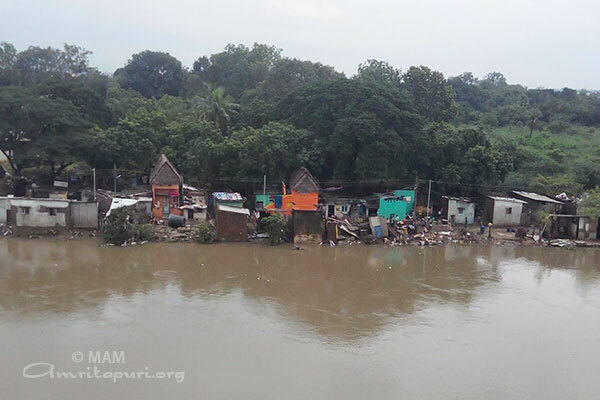 Water from the overflowing Adyar River submerged houses lying within a kilometer either side of the river, and floodwaters reached many other areas as well. 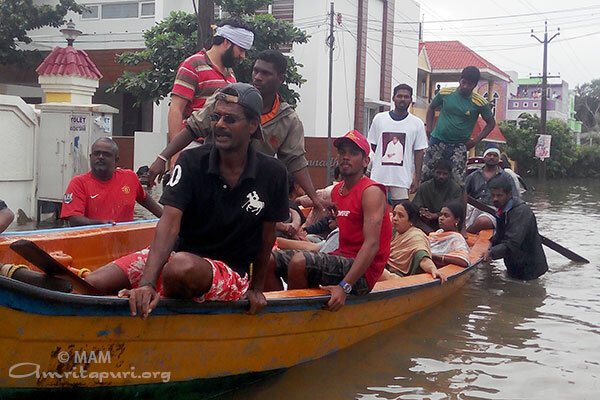 Hundreds of thousands of people have been affected. 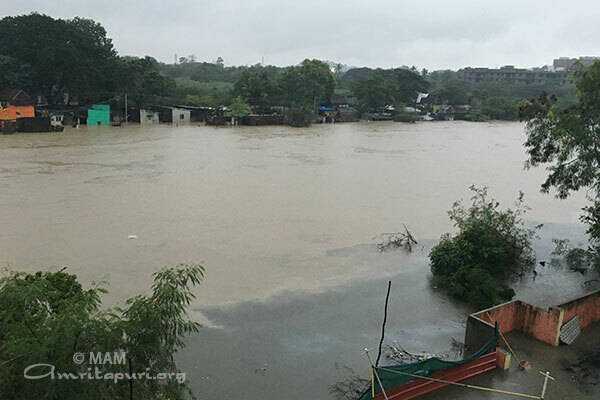 In many houses near the river, even the first floor was submerged, forcing people to take shelter on open terraces where they were exposed to rain and cold wind. 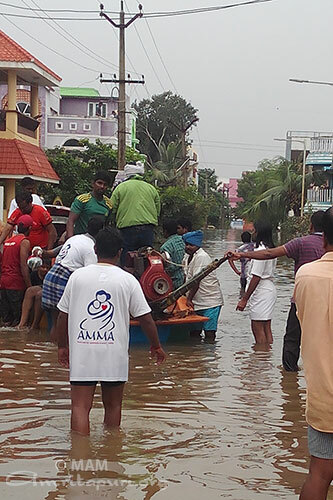 They were stranded there as the water level on the streets in some areas was approximately 40 feet deep. 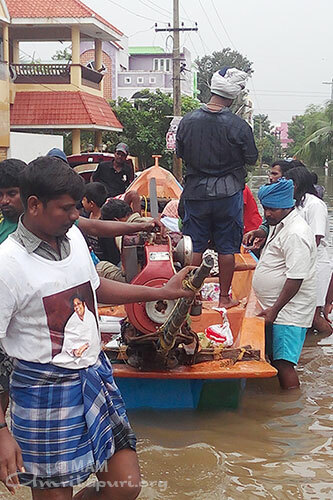 Amma sent volunteers to begin rescue operations in motor boats on December 2nd. 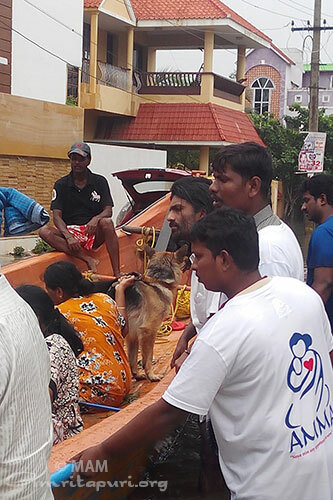 Ashram residents and devotees courageously risked their own lives to rescue people who had been trapped by the rising floodwaters, using ropes to safeguard themselves from being carried away by powerful currents. 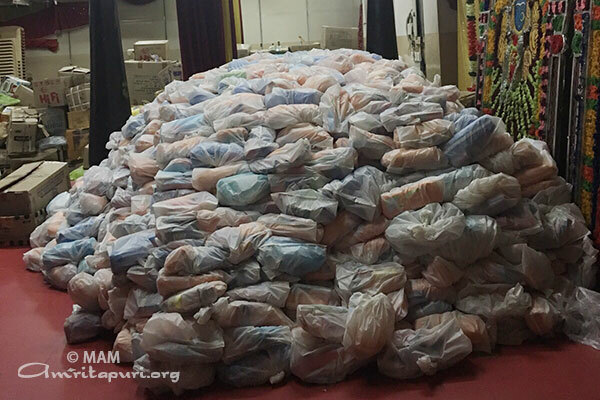 Food, drinking water and new sets of clothing was provided for evacuees. 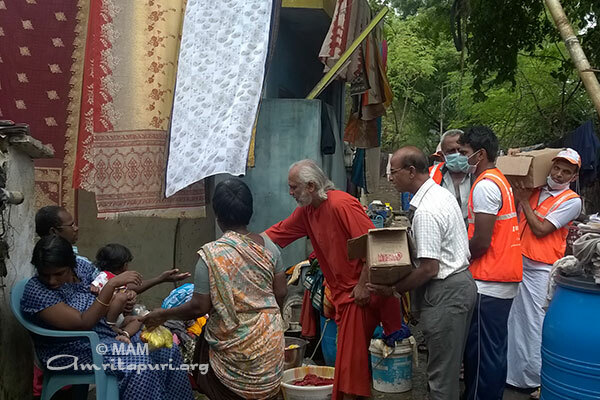 Packaged drinking water and food were supplied to those who preferred to stay in their homes. 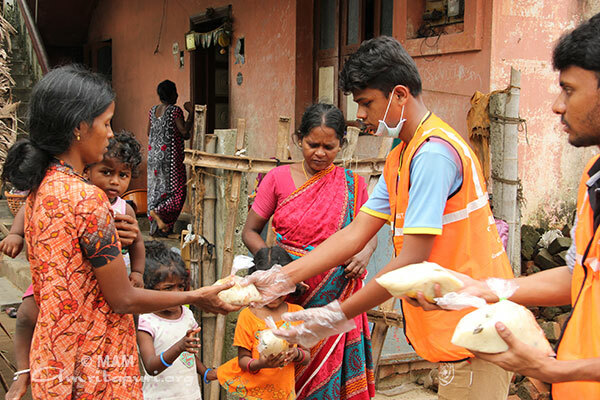 Even now, after the water has receded, our volunteers are continuing to provide meals for thousands of affected people each day. 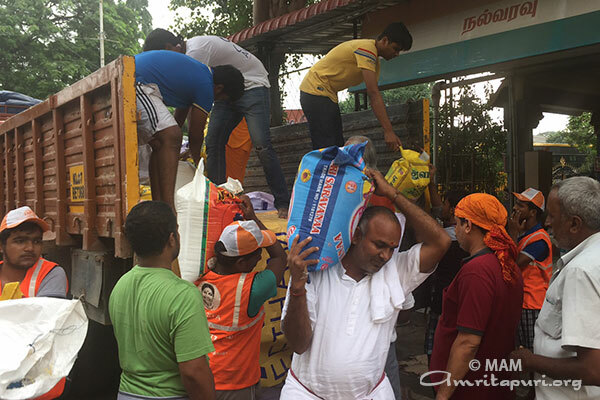 Hundreds of thousands of sets of clothing were also distributed to the flood affected people of Chennai. The Amrita Institute of Medical Sciences has successfully completed the first stage of a windpipe transplant on a cancer patient. The complex surgery is done in two phases. 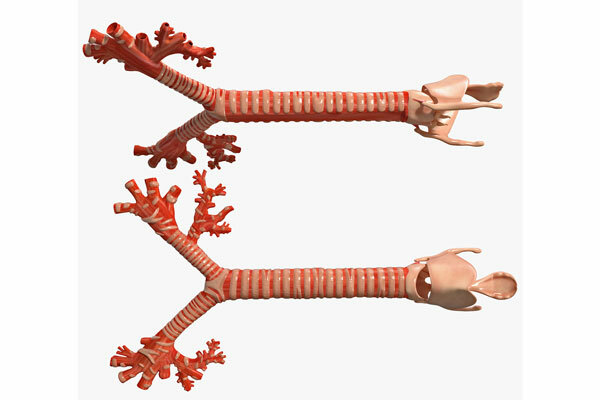 In the first phase, the windpipe harvested from the donor is embedded in the recipient’s forearm after stripping it of all cells. 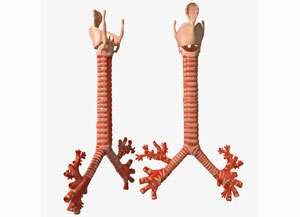 After two months, the recipient’s damaged windpipe is transplanted with the one which has been reseeded with his own. If all goes well in the second phase, this would be the first such surgery in India and the second worldwide. The procedure was done by plastic and reconstructive surgery department head Dr Subramania Iyer and team on a patient suffering from adenoid cystic carcinoma, a cancer affecting windpipe. 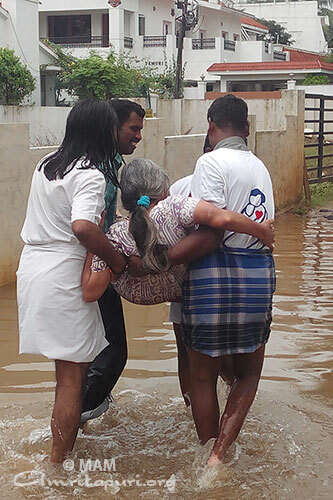 The Kochi native woman of 45 was under treatment in the hospital. The windpipe was of Renjith, a 37 year old film director who was pronounced brain dead after internal bleeding. 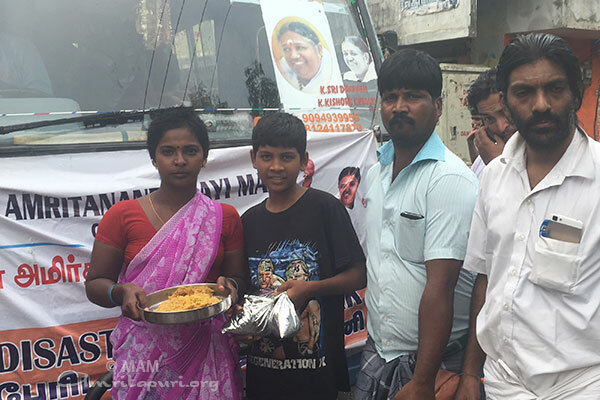 Renjith’s relatives also agreed to donate his liver, kidneys and corneas. One of his kidneys and liver were transplanted on a patient under treatment in Amrita hospital. The Amrita Hospital hand transplant team won the prestigious British Medical Journal award 2015 for the category of best surgical team of South Asia. These awards have been instituted to honour the contributions of various teams in this region in different aspects of medical care delivery. 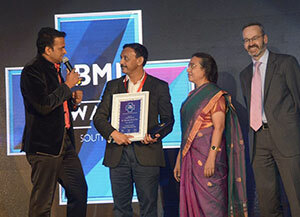 The BMJ awards has been considered as the “Oscars” in health delivery management. 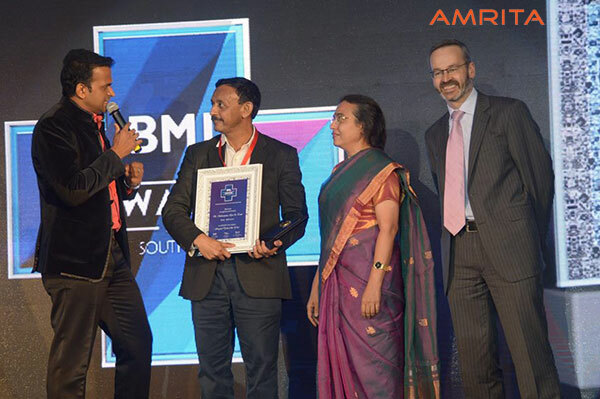 Dr Subramania Iyer received the award on behalf of the entire team. The awards are given after rigorous evaluation done in three stages by a reputed national and international jury team. There were more than 1000 entries for the various awards this year. The Amrita team won the award for the effort put in to successfully conduct the first and second double hand transplants in South Asia. 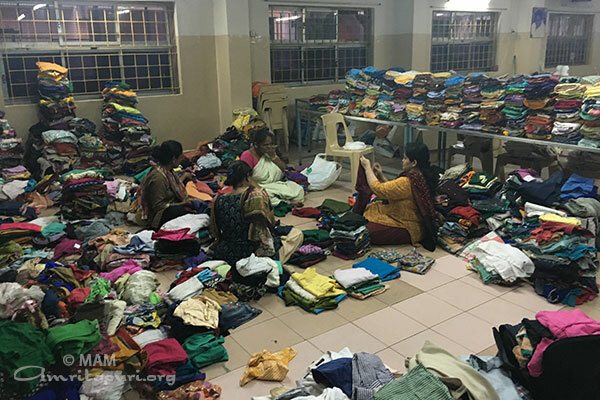 The meticulous planning and the immense dedication of the entire team to achieve this demonstrating the capability of an Indian centre to match the international standards was appreciated. 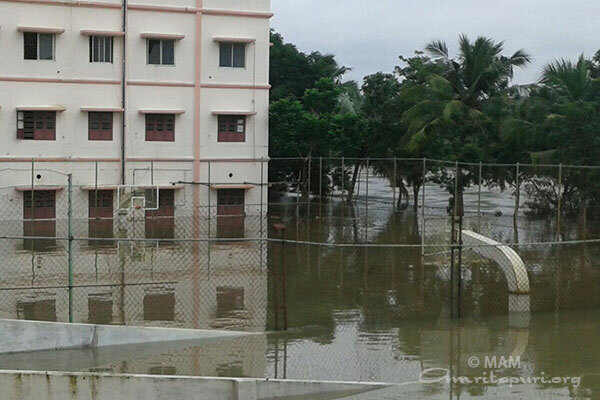 It is the second time in consecutive years Amrita Institute is bagging these awards. The Amrita paediatric cardiology team won the award last year for their leadership activities in this field.